Belle`s Beauty Boutique is rated 4.2 out of 5 by 11. Rated 5 out of 5 by alex_in_wonder from Fantastic Time management Game I had never been much of a fan of time management games - until I played this one. The early levels start out really simple so you can build up your skills in a simple way. Then the game gets progressively harder. I loved the Halloween theme towards the end of the game for a change. This may be the highest quality time management I've ever seen thanks to the gorgeous cartoon style graphics (as opposed to other TM). I spent a long time in hospital and this became addictive in wiling the hours away. Rated 5 out of 5 by verosasha from Awesome and Fun game!!!! cool game! love the levels and the stories! looking forward to buying it! Rated 5 out of 5 by jeadam from Cute, relaxing, girly game! Sometimes after a crazy week it's nice to just sit back with a cup of tea, pretty up your nails and play a fun, feminine game. 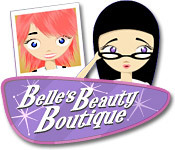 Belle's Beauty Boutique has fun music, cute characters, and feminine colors. The game play can get a little challenging, but I've never found that to be a horribly bad thing. I would recommend this game to anyone that enjoys Spa Mania, Jojo's Fashion Show, and other similarly themed series. 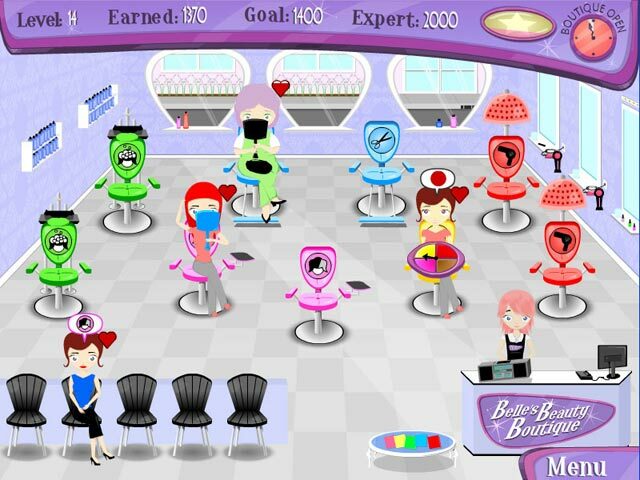 Rated 5 out of 5 by tearsrain15 from Belle's Beauty Boutique is awesome This game is Old school but lots of fun! I would definitly recommend it! Rated 4 out of 5 by pikachu2010 from Cute, Relaxing Game! Meet Belle, an aspiring make-up and hair stylist that dreams of opening a successful beauty salon. Help her in giving both guys and girls life-changing makeovers and even styling celebrities! Overall a very enjoyable game I loved playing as a child, since it is quite outdated don't expect any flashy graphics and audio. Levels can become a bit challenging to younger children, when I played this game as a child I used to end up playing levels multiple times just to achieve the required score. There are cute upgrades and characters with a special makeover that recharges as you play the levels, you can also customise your boutique to make it more personalised. Game is a little glitchy and has crashed on me before but it isn't to the extent that would make you uninstall the game. The main things to take into account are that this is a medium-paced game that is child friendly and has occasional glitches. It is very enjoyable, has cute graphics and a customisable salon! Rated 4 out of 5 by jdbbrz from Pretty cute I don't play to many games but this one can keep my interest and isn't way to fast or boring and the plot isn't major lame. Rated 4 out of 5 by Pucktweety from A very good game. The graphics on this game isn't amazing so it might put some people off but it is a very good game. My only problem is that I would like it to be a lot harder. Although it does progress from very easy to somewhat hard, it doesn't get to that insanely challenging level that I expect from a TM game. Although it still is very, very fun. Rated 2 out of 5 by Selkie2283 from Repetitive & Visually Boring I didn't make it past the free trial, so maybe it eventually gets more challenging. The levels are repetitive, and I found the game play pretty easy. Visually, it's pretty boring. The stations look almost identical, except for the color of the chair. The animation for each station is very simplistic, and unnoticeable. The only upgrading you do is to decor, and your options are very limited. To me, this felt like a very bare-bones Time Management game, or like the beta of one. It just couldn't hold my attention.